Restaurant Victoria is one of the most famous chains in Bulgaria with their first restaurant opening back in 1997. 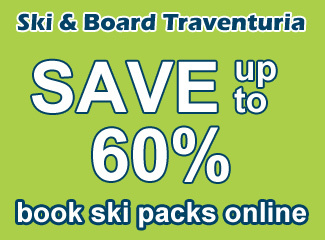 They have locations in Sofia, Plovdiv, Borovets and, of course, Bansko. The prices aren’t the cheapest (nor the most expensive), but in return, you get good food and a nice atmosphere. 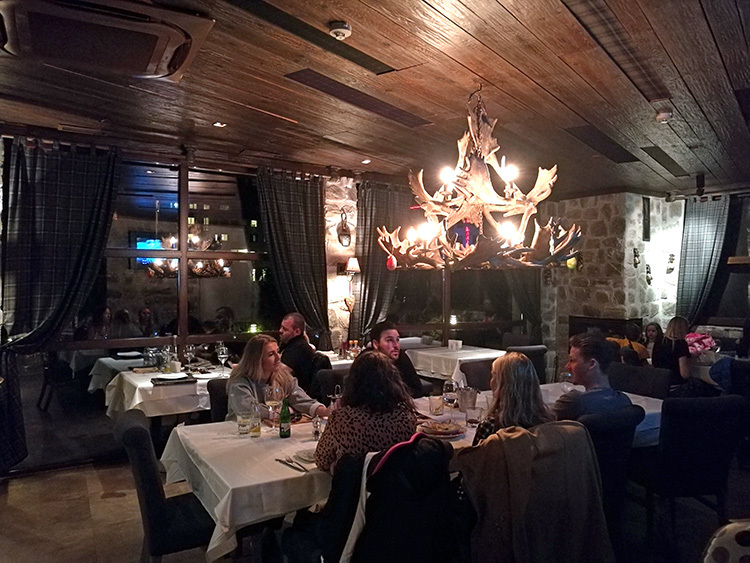 It’s one of the top 10 restaurants on TripAdvisor* for Bansko and is definitely worth a visit if you like Italian cuisine. Victoria is also one of the few restaurants in Bansko that offers free delivery to your hotel or apartment. 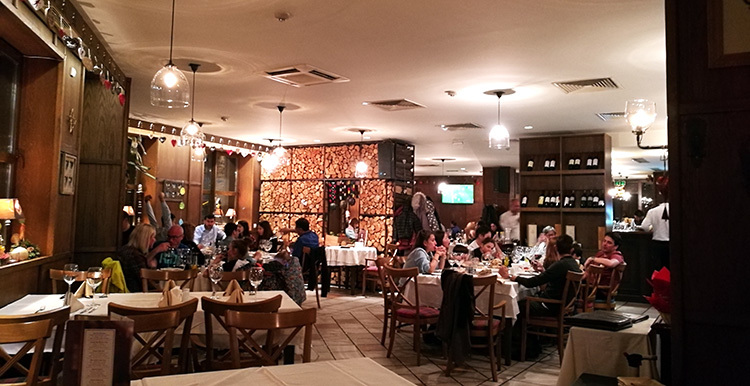 Restaurant Victoria is located on Pirin street, opposite the Kempinski hotel. 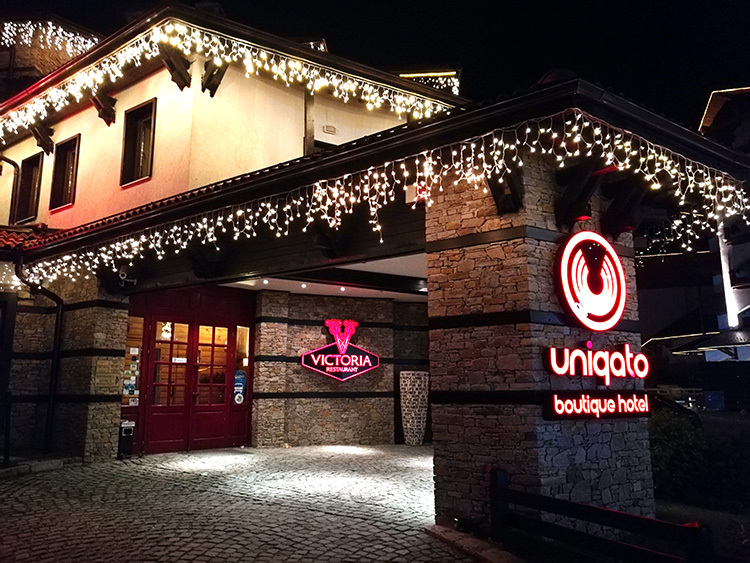 The Victoria restaurant is located in the same building as the Uniqato Boutique Hotel (119 Pirin str. ), across the street from the Kempinski hotel and around 200m away from the top gondola station. 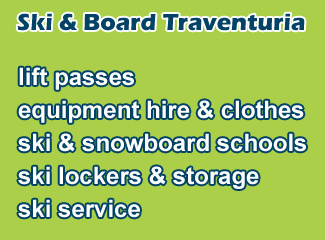 Its location makes it a good choice for an after ski stop, but keep in mind that they don’t allow you to enter with ski/snowboard boots. The good thing is they have hotel-style slippers for customers who haven’t switched to their normal shoes already, but I can only imagine what that’s like after a warm and slushy day on the slopes. The restaurant also has an outside garden for the summer and works throughout the year, unlike many restaurants which close down at the end of the winter season. The restaurant is spacious and has plenty of seating, but you should always call ahead and make a reservation during the winter season if you plan on having dinner there. Even outside the high-season, you may have to wait in line to be seated if you didn’t book a table. There is a hostess at the front door to make sure everything is running smooth, but that can be sometimes mission-impossible when the restaurant is full. 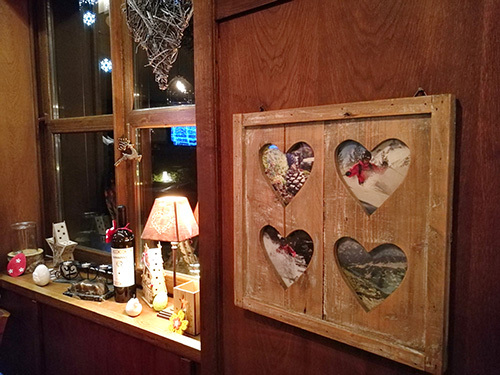 Once inside you’ll notice the wooden decorations, which give the place a pleasant atmosphere. If you judge by the interior, it doesn’t feel cheap, but it’s also not over-the-top luxury, perfect for casual dining. The restaurant’s popularity is also its main downside. As with most restaurants, when the tables are completely full and you have people waiting in line to get in, serving them perfectly is very difficult and you may have to wait longer than usual to for your food to arrive. 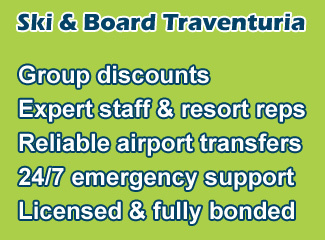 To make a reservation you can call their hotline – +359 2 911 00. If you’re in the mood for pizza, then Victoria makes some of the best in town. The pizzas are cooked in a furnace heated on wood, rather than the typical electric pizza oven which is used in most other restaurants. The small pizzas are around 500gr (+/- 50gr), while the bigger sized pizzas are around 700-750gr and they also serve family sized pizzas which are between 1500gr and 2000gr. Weights vary depending on the pizza and toppings you choose and the family sized ones will easily feed 2-3 people. 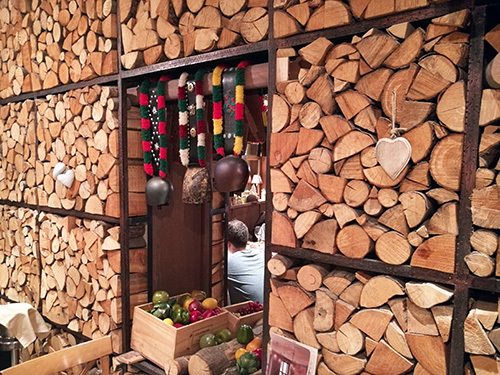 Other than pizza you’ll find a wide variety of other dishes on the menu (pasta, tagliatelle, grilled meat, risotto), including some Bansko specialties (kappama, chomlek, katino meze). The signature burger, double cheeseburger with black Angus veal, is also worth noting if you’re a burger fan. For the meat eaters, you can choose between chicken, veal, lamb, pork and fish dishes and there are plenty of vegetarian options as well. One of the more interesting salads is with goat cheese, but they also have the standard shopska and ovcharska salads, found in every Bansko restaurant. So how much will a typical meal in restaurant Victoria cost you? It really depends on what you order as they have a wide price range and some expensive meats. 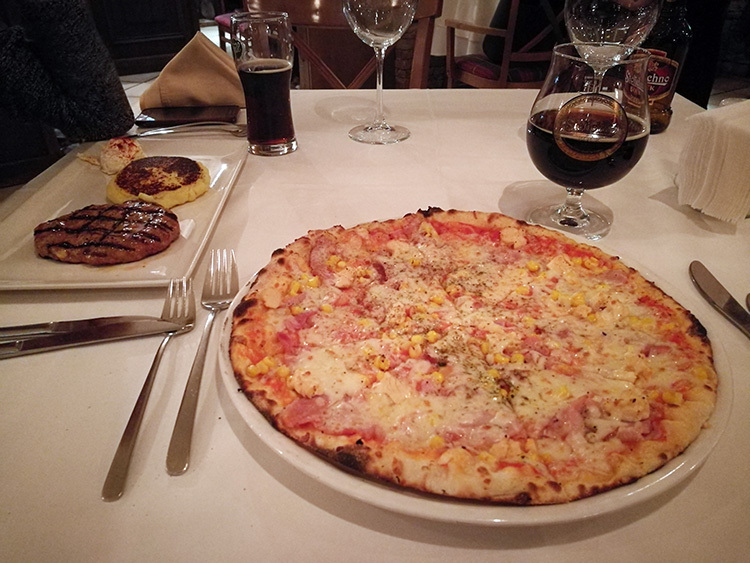 For a salad, big pizza and beer you can expect to pay around 30lv (15 euro). If you’re in the mood for something more interesting, like a veal steak or roasted lamb (≈30lv per dish), you can expect the bill to be much higher. Spaghetti bolognese or carbonara are 12-13lv and a portion of salmon is around 20lv. You can find most of their menu online and see the prices there. Make sure when looking at the online menu you’ve selected Bansko (not one of the other cities) as prices in the resort are higher than those in Sofia and Plovdiv. Pizza Bonifacio and serbian pljeskavica. 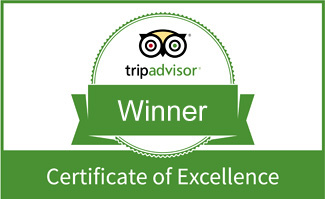 *Restaurant Victoria is rated #10 in Bansko, according to TripAdvisor rankings and reviews as of April 10th, 2018.